From Wall Street Journal sports reporter and NPR commentator Fatsis (Wild and Outside, 1998), a comprehensive guide to the world of competitive Scrabble. Fatsis used to play a pretty mean game of Scrabble—or so he thought, until he began investigating the game for an article and found himself becoming nearly as obsessed as the hard-core players he interviewed: G.I. (as in gastrointestinal) Joel Sherman, the pill-popping comedian Matt Graham, and Marlon Hill, an ardent young black nationalist. They all spent their lives learning new words and playing in tournaments to win the prizes that were their only income. 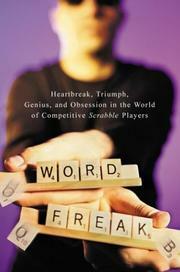 Some loved words for themselves, others merely as means to an ends—and Fatsis advises anyone thinking of playing competitive Scrabble to face the reality “that the game requires learning words that may not have any outside utility.” Ultimately, competitive Scrabble is “about mastering the rules of the game, and the words are the rules.” The author takes lessons from the champions, plays at competitions, and learns about bingos (using all seven tiles at once), alphagrams (rearranging the letters of words in alphabetical order), and coffeehousing (unnerving your competitor by talking during a tournament). While working on improving his ratings as he competes from Manhattan to Reno, he also researches the history of the game. Invented by an unemployed architect named Alfred Butts during the Depression, Scrabble did not catch on until the 1950s, when increased leisure led to sales of over three million sets in the US and abroad. Competitive Scrabble, Fatsis concludes, attracted him because it allowed him to deal with old issues straight off a therapist’s couch (i.e., control, order, power), as well as giving him a new way to meet friends, pass time, and make a name for himself (i.e., a hobby). Despite an occasional overload of detail, this is a provocative look at the world of games and the way the mind works with words.